Dark sky programming at Newport State Park (WI), an aspiring Dark Sky Park. Photo by Denny Moutray. Our International Dark Sky Places program is rapidly expanding as more and more people learn of the benefits of a dark sky designation. Here’s a sampling of some of the positive impacts a designation can provide. Gaining dark sky status means that parks and communities provide public education about dark skies. This new programming often attracts new visitors. A designation is also a good marketing tool because it provides new and unique ways to draw visitors. 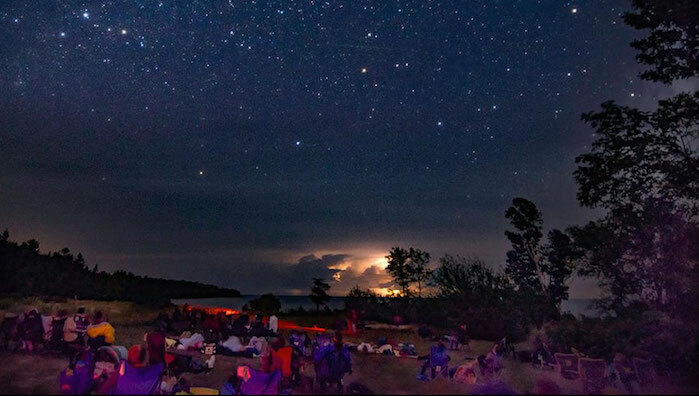 A study of patterns of use in Pennsylvania State Parks found that dark skies drive a great deal of visitation to Cherry Springs Dark Sky Park. According to the report, park visitors were much more likely to cite “other” as their primary activity type (44.9 percent). Not surprisingly, this “other” category included night sky viewing. The study also found that the number of visitors attending evening programs in the park nearly doubled from 13,451 to 23,878 with an estimated increase in economic impact from $1.1 million to $1.7 million. The increase in visitors due to a dark sky designation also means an increase in customers for local area businesses. A “Dark Sky Park Economic Impact Assessment” looked at the impact on local business a year after Galloway Forest Park in Scotland became an IDA Dark Sky Park. The report found that for every £1 spent on installing dark sky friendly lighting in the area, there was a return on investment of £1.93, due to an increase in tourism, and concluded that the economic benefits are probably much more. According to the report, “It should be noted that this is only a partial assessment of the economic impact of the Dark Sky Park. There are a number of factors which mean that the full impact of the Dark Sky Park will be much higher.” These factors include visitors who may come only for the day and visitors who stay with friends and relatives rather than at paid-for accommodation. In fact, the designation of the combined areas of Northumberland National Park and Kielder Water Forest Park in the U.K. as a Dark Sky Reserve prompted the U.K. government to offer workshops to help local area businesses take advantage of the surge in interest about dark skies. To achieve a dark sky designation, parks and communities must ensure that the area lighting is dark sky friendly, making the areas darker. A study looked at the brightness of the night sky over Mont-Mégantic Observatory, home to a Dark Sky Reserve in Quebec, Canada. It compared the night sky brightness of the area before and after it became a Dark Sky Reserve and found that the sky over Mont-Mégantic is now as dark as it was in 1979! The improvement of sky quality is firmly attributed to policy changes and lighting retrofits conducted in towns and villages in and surrounding the Dark Sky Reserve.